Rhydycar Leisure Centre, Merthyr Tydfil was the focal point for an evening of scintillating boxing in a hot and humid packed-out cauldron. Sanigar presents served the paying public, a hugely entertaining bill that had several bouts worthy of being the fight of the night. The packed venue witnessed all the drama that only boxing can bring. 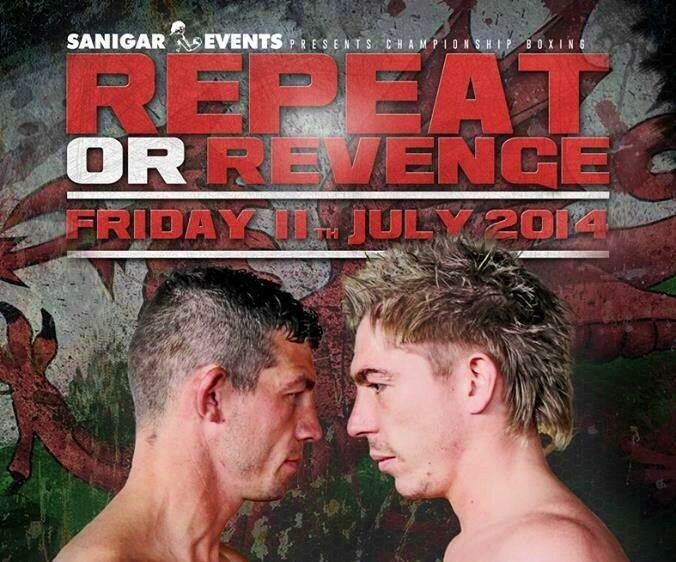 The headline act of ‘Repeat or Revenge’, was for the Welsh featherweight title between the champion Dai Davies and challenger Robbie Turley. Davies, was the home-town man but both had loud support and they battled with every ounce they had to give. the end by a left hook. The opening rounds and the ones that followed were closely competed and ‘machismo’, often prevailed as the two warriors chose to trade hard. It was from round six that Turley, was becoming tired while Davies kept going and looked the stronger of the two and in round seven the challenger took a torrid pounding on the ropes, referee Clarke Joslyn was closely look at stopping the fight. Turley, bravely came out for the 8th but the champion was asserting pressure and picking his shots well, with not enough coming back. Robbie Turley, was pulled out at the end of the round and this tremendous contest, was won by the defending champion Dai Davies. Dai Davies record is now 11-23-2 while Robbie Turley is 13-5. 21-year-old Tony Dixon got six rounds of experience that is invaluable, as he faced the experienced journeyman William Warburton. Warburton recently upset prospect Georgie Kean and is the type of fighter that will jump on the opportunity for another upset. Dixon started slowly, in the first and that was all the encouragement that Warburton needed, William moved well and was negotiating the power and timing of Dixon. But, in the second Dixon adjusted and started getting closer and with each round got closer to his man to unload the bombs. In the third and fourth Dixon, was able to let the hands go with vicious combinations and any thoughts of an upset, were seemingly far from Warburton’s mind. The Atherton journeyman, was still trading at points and looking for a big counter but the fight was being controlled by Mountain Ash’s Dixon. Referee Reece Carter had it 59-56 for Dixon. Tony Dixon’s record now reads 5-0 while William Warburton is 13-64-4. Cardiff’s ‘The Kid’ Craig Kennedy, maintained his unbeaten record with a solid boxing display against Lithuanian, Remigijus Ziausys. The 30-year-old import was game and at times took shots well, but was never in the running to pull-off an upset. Kennedy, employed a solid jab and in the later rounds good movement, to control the pace and tempo of the action. Ziausys had a few spirited two-handed attacks but at no time troubled Kennedy. Another six rounder in the bank, for Kennedy and now hopes of finally getting someone in the ring to fight for the Welsh cruiserweight title. Craig Kennedy is now undefeated at 9-0 while Remigijus Ziausys falls to 20-58-5. Jimmy White and Luke Osman originally had different opponents, but as so often happens ended up fighting each other. White had only fought once before, losing on points in 2002, while Osman had been meant to face Swansea’s James Lilley, in a Welsh title eliminator. The four round contest was highly entertaining and an absolute bloodbath, the opener was a right scrap with Osman badly cut over the left-eye. The cut flowed with blood, for most of the fight and it’s a credit to Osman that he remained composed through-out. I gave the first two rounds to White, who was applying constant pressure and banging away on the inside. The third and fourth I gave to Osman, as he was picking his shots, while White’s ‘engine’ was slowing down. Both showed impressive punching through-out but at the end I couldn’t split them, referee Reece Carter saw it in favour of Luke Osman with a scorecard of 37-40. Luke Osman’s record now reads 4-12-1 while Jimmy White is 0-2. Rochdale boxer Jason McArdle put in a strong performance against debutant Kyle Jones of Pontypridd in a four round, welterweight contest. The bout was competitive through-out between the two orthodox fighters. Jones showed good variety, in his punches, but McArdle’s right hand often came-out on top and at times the visitor was finding a home for it. McArdle was the bigger man and seemed to have the edge in strength, as he applied pressure. I scored it 39-38 to the Rochdale boxer. Referee Clarke Joslyn scored it 39-38 to Jones. Kyle Jones career gets off to a winning start at 1-0, while Jason McArdle drops to 2-7. Iranian born prospect Hasan Karkardi, looks one to watch as he showed a good variety of punches and movement to defeat Latvian Andrejs Pokumeiko; by retirement at the end of the second round. 26-year-old Karkardi is based in Bristol, and after a tentative opening stanza, he turned up the heat in the second round. Pokumeiko was hurt from a left and wasn’t coping with the increase in power that his opponent was bringing. Pokumeiko retired at the end of the second, due to blurred vision in the left eye. Light heavyweight Hasan Karkardi’s record improves to 3-0 and Andrejs Pokumeiko drops to 6-5. Final fight of the night was a Heavyweight clash between evenly matched Dorian Darch and Tom Little. Little was flamboyant through-out the contest and both men landed thudding shots, to head and body, in a tough and at times free-swinging contest. The main thing that separated the two, was a heavy knock down of Little in the second round. The Hertfordshire man did well to get-up and spent the rest of the round holding on; to good effect. It was Aberdare’s Darch that overall landed the cleaner shots, in a close action packed fight. Referee Clarke Joslyn had it 39-36, to the rightful winner Dorian Darch. Dorian Darch is now 8-3 while Tom Little is 4-3.